these days and, frankly, a bit irrelevant so we decided to just do these two sided vinyl EP’s with 4 songs each. Lawrence muses. Stop Making Sense performances “We also thought it would be an incredible adventure to put together, periodically, the actual Stop Making Sense performance. It’s a concept that starts with ostensibly no stage setup and out comes David Byrne with a beatbox and and an acoustic. The stage slowly builds to a full performance as the players and gear ebb onto the stage – until a mid show climax with Byrne in a giant suit. It's great fun to honor the performance that was the nucleus for this project.” The band is performing Stop Making Sense, Talking Heads, and Original Material in premier venues around the country. Portland’s Life During Wartime band offers an authentic tribute to Talking Heads. 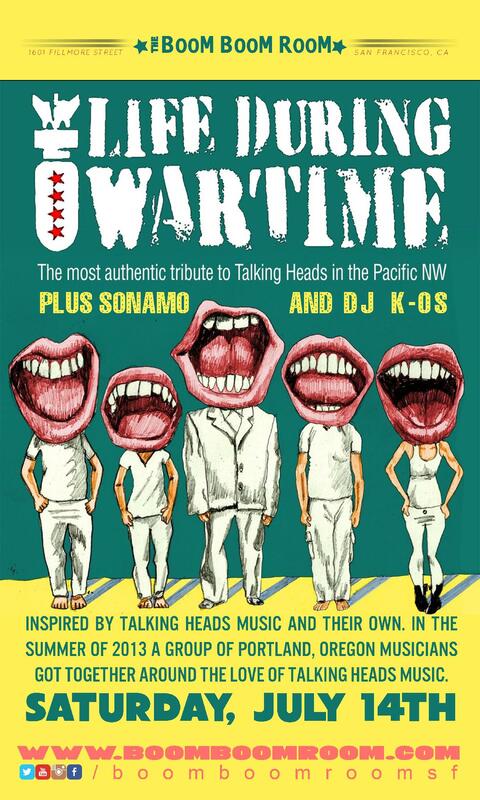 In honor of the 30th anniversary of one of the most innovative concert films of all time, Stop Making Sense by the Talking Heads, eight local musicians came together to form Portland’s very own Talking Heads tribute band, Life During Wartime. Life During Wartime boasts some of the most talented musicians in Portland. Lawrence Orleck, from NYC, is the group’s David Byrne, providing the manic energy central to the Talking Heads experience. While nailing the vocals with an infectious enthusiasm, Orleck is an accomplished performer who jogs in place, runs around the stage and executes the kind of mad theater that always made the Talking Heads a unique live show. Dave Smith is the bass player for the band. He’s played on over 50 records – Much of it with world-class musicians from bands like Prince, Santana, Lauryn Hill, Marcia Ball, Lady Gaga, and Tony Bennett. He’s written hundreds of songs with dozens of bands, including Blondie. Chuck Warda plays the Alex Weir role and his infectious, funk stylings keeps the band driving and locked in.